Here is a guide to Install Third-Party and Windows Store Extensions on Microsoft Edge internet browser. Edge browser comes pre-installed on all Windows 10 versions and is the default Windows browser. It is by no means behind other Chrome, Firefox , Opera and other best web browsers in terms of performance. Microsoft Edge is fast, stable, consumes low RAM and system resources when handling multiple tasks at once. It is the ONLY web browser that can play Netflix videos at 1080p quality for now. You can now install third-party, Windows Store and other external extensions on Microsoft Edge. Users of Insider Preview Build 14291 can install this feature to have external extensions on the Edge browser. In this guide, you can see the method for installing Windows Store and other third-party extensions on Microsoft Edge. For installing extensions that are not available on Windows Store, see instructions below. Developers are creating extensions for Edge browser but there might be some popular extensions that might not be available on Windows Store yet. To install those third-party extensions, see the guide below. With time more extensions will be added to Windows Store but for now you can follow this trick to install extensions not available on Windows Store. 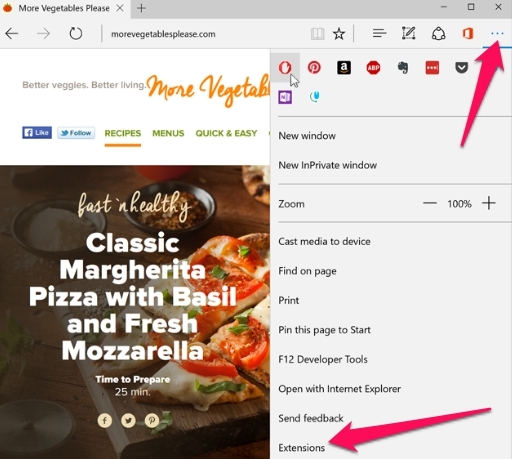 Here’s how to install third-party extensions on Microsoft Edge browser. But make sure that the third-party extension that you are installing is from a reliable source since some extensions could cause damage by spreading virus on PC. So, check before installing external extensions. 1 – Download Third-party extension on your PC. 2 – Most extensions come in .zip or .exe format. So, extract the zip file or simple launch the .exe file to get the extensions ready. 3 – Open Microsoft Edge and click on More option (indicated by three dots). 4 – Under More, select Extensions and then click on Load Extension. 5 – Now navigate to the folder where you downloaded third-party extension and load it. 6 – After loading the extension, click Turn On when asked to allow permissions. That’s All. Now let’s see how you can install extensions from Windows Store on Microsoft Edge. Installing Windows Store extension is similar to how you install extensions on any other web browser from their extensions download section. Open Windows Store on PC or tablet and search for the Edge browser extension that you want to install. Here is the list of some of the Microsoft Edge extensions available for download for free. Just click any of the extension that you want to install on the Edge browser and select Open in Store option, which will take you to the Windows Store page for that extension on PC from where you can install it directly on Microsoft Edge. Make sure that you have Microsoft Insider Build 1429 or later installed on PC to be able to use extensions from the developer link above. These are all official extensions from Microsoft. Next to install the extension click on ‘Free’ button which will download and install that extension on Microsoft Edge. Close Windows Store and go to Microsoft Edge web browser and allow extension permission by clicking ‘Turn On’ option. Here’s how you can see the extension icon: click on the ‘More’ button on the top left corner of the Edge browser window. Now click ‘More’ and then ‘Extension’ option to see the list of installed extensions. Click on links below to go directly to the Windows Store link for the following extensions.